Background: In the era of drug-eluting stents, although bare-metal stent (BMS) remains an option for percutaneous coronary intervention (PCI), restenosis remains the Achilles' heel of BMS implantation. A recent study demonstrated several pleiotropic anti-inflammatory effects of dextromethorphan (DXM). This study aims to evaluate the effects of DXM on the outcome of PCI with BMS implantation. Methods: In this prospective, double-blind, randomized trial, we enrolled 55 patients who underwent PCI with BMS implantation from May 2006 to February 2009. The patients were divided into DXM (60 mg once daily) and placebo groups. We compared mortality rates, myocardial infarction (MI), target lesion revascularization (TLR), restenosis, stent thrombosis, and plasma levels of high-sensitivity C-reactive protein (hs-CRP) with repeated coronary angiography 6 months after the initial procedure. Results: During the 6-month follow-up period, no events of death, MI and stent thrombosis were reported in both groups. The TLR rate was 16.7% in patients receiving DXM compared to 24% receiving a placebo (P = 0.521). The restenosis rate was 30% in patients receiving DXM as compared to 40% receiving the placebo (P = 0.571). Although nonsignificant, the percentage of hs-CRP elevation was lower in the DXM group (20%) compared to the placebo group 32%; P = 0.363). Conclusions: DXM is safe to use in patients who underwent PCI. Although DXM therapy following BMS implantation did not significantly reduce the TLR and restenosis rates, it implied a trend toward a lower TLR and restenosis and reduced inflammation in the DXM group compared to the placebo group. Nonetheless, further extensive studies are warranted to elucidate the anti-restenosis effects of DXM. Although percutaneous coronary intervention (PCI) revolutionized the management of coronary artery disease (CAD), restenosis after a successful balloon coronary angioplasty or intracoronary stent placement remains the Achilles' heel of PCI. Restenosis, defined as a ≥50% diameter stenosis within the treatment site at follow-up, is associated with the increased rates of reintervention and major adverse clinical events, including myocardial infarction (MI) and death. The primary mechanism of restenosis in a stented coronary artery is neointimal hyperplasia after intimal injury with inflammatory reaction.,, Reportedly, the drug-eluting stent (DES) can significantly reduce restenosis as compared to bare-metal stent (BMS) implantation. Even in the era of second- and third-generation DES, BMS plays a role in PCI, especially in patients who cannot tolerate the recommended duration of dual antiplatelet therapy due to noncompliance, the need for noncardiac surgery, or increased risk for bleeding. Dextromethorphan (DXM) is a dextrorotatory morphinan that is widely used as a nonopioid cough suppressant in several over-the-counter remedies. Lately, the potential anti-inflammatory effects of antitussives have been explored, in addition to their clinical application. A recent study demonstrated that DXM reduced the inflammation-mediated degeneration of dopaminergic neurons by inhibiting microglial activation. Moreover, the neuroprotective activity was proved through animal models of cerebral ischemia and hypoglycemic neural injuries.,, However, the anti-inflammatory activity of DXM on CAD remains unclear. Therefore, this study tested the hypothesis that the potential anti-inflammatory effect of DXM therapy might prevent restenosis and improve clinical outcome after PCI with BMS implantation. We conducted this double-blind, randomized trial at Tri-Service General Hospital, National Defense Medical Center (Taipei, Taiwan) from May 2006 to February 2009. We enrolled patients with stable angina and objective evidence of myocardial ischemia who were admitted for coronary angiography and completed PCI with BMS implantation. This study adhered to the ethical principles in clinical research and was approved by the Institutional Review Board of the center (IRB 094-05-0035). We obtained informed consent from all patients enrolled in this study. 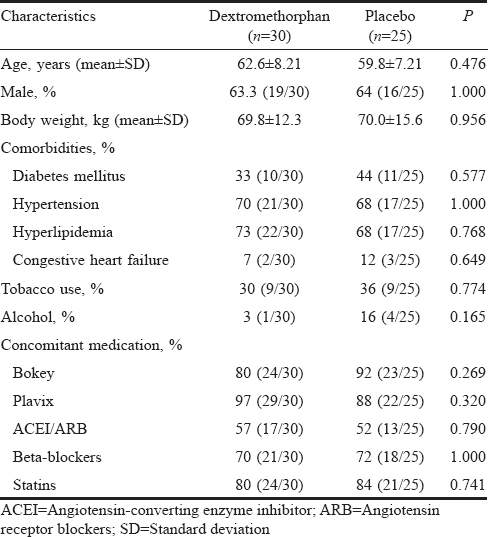 The inclusion criteria included ages between 20 and 80 years, stable angina with objective evidence of myocardial ischemia, significant CAD, and patients who underwent PCI and BMS implantation. In contrast, the exclusion criteria included acute MI <3 months; restenotic lesions; vein graft lesions; patients who received primary PCI; and allergy to DXM, contrast media, or antiplatelet agents. We performed BMS deployment according to the standard practice. The degree of coronary artery stenosis was assessed by visual estimation and quantitative coronary angiography analysis. Patients with stenosis ≥70%, requiring PCI and BMS implantation, were eligible candidates for this study. Dual antiplatelet therapy (aspirin + clopidogrel) was provided at least 1 month after PCI. Randomization was performed in a double-blind manner with the use of sealed envelopes containing the block randomization sequence. The treatment protocol is summarized in [Figure 1]. Double-blinding was achieved by the use of similar-appearing capsule containing either 60 mg of DXM or placebo per day for the respective treatment groups for 6 months after PCI. We executed a clinical follow-up in the following 1, 3, and 6 months after the procedures by telephone contact or office visits. In addition, a follow-up coronary angiography was performed in all patients 6 months after PCI as per the protocol. The study end point was the 6-month mortality rate, MI, and target lesion revascularization (TLR). Stent thrombosis was defined on the basis of the Academic Research Consortium definitions for definite or probable stent thrombosis and further categorized as follows: acute <1 day; subacute as 1–30 days, and late >30 days. Angiographic restenosis was defined as ≥50% in-stent stenosis (reference vessel diameter – minimum luminal diameter)/reference vessel diameter ≥50%. The level of high-sensitivity C-reactive protein (hs-CRP) was detected before and 6 months after PCI. Statistical analyses were performed using the SPSS software package (version 21.0; SPSS, Chicago, IL, USA), and P < 0.05 was considered as statistically significant. While continuous variables are presented as mean ± standard deviation, categorical variables are presented as the number of patients and the corresponding percentage. The differences in the characteristics of groups were assessed using an unpaired two-tailed Student's t- test or one-way analysis of variance for continuous variables and Chi-square and Fisher's exact tests for nominal variables. Of 64 patients initially enrolled in this study, 9 withdrew consent after randomization. At the end of the study, thirty patients were in the DXM group and 25 in the placebo group [Figure 1]. No statistically significant difference was observed in the baseline characteristics of these two groups [Table 1] and [Table 2]. TLR rates 6 months after PCI were 16.7% in the DXM group and 24% in the placebo group (P = 0.521). Angiographic restenosis 6 months after PCI was reduced 10% in the DXM group (30%) compared to the placebo group (40%; P = 0.571). In comparison with the baseline, the percentage of hs-CRP elevation was 32% in the placebo group higher than 20% in the DXM group (P = 0.363) [Table 3]. Although all study end points were not statistically significant, it revealed a trend toward a lower TLR and restenosis rate in the DXM group compared to the placebo group. No death, MI, and stent thrombosis were reported in both groups. Only one serious adverse event occurred in this study; a patient with a history of peptic ulcer disease in the DXM group developed upper gastrointestinal bleeding. This study investigated the effects of DXM on PCI with BMS implantation. Although DXM therapy following BMS implantation did not significantly reduce the death, MI, TLR, and restenosis rate, it exhibited a trend toward a lower TLR and restenosis rate compared to the placebo group. Moreover, DXM administration was safe without any side effect and did not lead to treatment withdrawal in this study. Increased knowledge of pathophysiology of restenosis after BMS implantation has facilitated the recognition of event prevention. Neointimal hyperplasia is the primary component of restenosis after BMS deployment. The prevalence of angiographic restenosis after BMS deployment is up to 40%–60%. Despite several attempts to reduce restenosis rates, only reduction of the stent structure thickness resulted in reduced restenosis. Several interventional devices, including laser excimer atherectomy, directional atherectomy, rotational atherectomy, and cutting balloon angioplasty, have been applied to prevent restenosis; however, the results have been discouraging. Although intracoronary radiotherapy using beta and gamma emitters promises the prevention of restenosis, the unresolved issues for intracoronary radiotherapy include cost, logistics, long-term safety, and late-stent thrombosis. Reportedly, pharmacological approaches have not consistently reduced the frequency of angiographic or clinical restenosis after PCI despite trying several agents. Furthermore, the reduction of restenosis was essayed by oral drug administration. However, the results of the drugs attempted were not convincing to warrant their introduction into clinical practice. Previous investigations, including the oral sirolimus to inhibit recurrent in-stent stenosis, oral rapamune to inhibit restenosis, and oral rapamycin to prevent restenosis in Argentina and other studies, evaluated the oral use of sirolimus and reported an average efficacy. Unfortunately, these drugs brought about several major adverse effects, which might have contributed to their lack of interest in Phase III clinical trials.,, On the contrary, DXM had no major side effects and was safe and well tolerance. In the early phase of stent implantation leading to endothelium injury, inflammatory process progressed. Several studies have highlighted the significance of inflammation as an early event after stenting in different animal models using specific antibodies to leukocytes (CD45), macrophages (CD14), and monocytes (CD115). The anti-inflammatory effect of DXM was by inhibiting lipopolysaccharide (LPS)-induced superoxide production than the production of nitric oxide and tumor necrosis factor-α (TNF-α). A previous study demonstrated protective effects of DXM against LPS-mediated neurodegeneration in neuron–glia cultures or against endotoxic shock in mice by inhibiting the inflammation reaction, not potential antagonistic effect on the N-methyl-D-aspartate receptor complex. The DXM-induced reduction in superoxide was attributed to the inhibition of production, but not scavenging of the superoxide free radical. Current studies have proved that the protective mechanism of DXM is reducing the LPS-induced production of superoxides, free radicals, and TNF-α through the inhibition of nicotinamide adenine dinucleotide phosphate oxidase., The anti-inflammatory effect of DXM not only relates to the reduction of reactive oxygen species but also with the reduction of TNF-α secretion. Such evidence suggested the anti-inflammatory effects of DXM, which might reduce neointimal hyperplasia of stented coronary arteries. DES was an expandable framework, used as a platform to carry and release drugs at the site of coronary lesions. The drugs most commonly administrated in the current clinical practice are from limus family and paclitaxel, which markedly reduce the chance of restenosis compared to BMS., DESs with some cell mitosis inhibitors, such as dexamethasone and tacrolimus, have not demonstrated sufficiently positive effects in preclinical and clinical studies to allow their use in clinical practice., The improvements in newer-generation DESs have translated into better safety and efficacy compared to the earlier generation DESs and BMS. However, high costs have hindered the introduction of this material on a large scale in underdeveloped or developing countries, despite the long-term cost-benefit that seems to be better in DES., Therefore, searching for a low-cost treatment with a protective effect on restenosis is imperative for patients with limited financial resources. Furthermore, the feasibility of effective and safe treatment, which was not used in the population due to its high cost, should be addressed. This study has several limitations. First, the sample size is small. Second, 6-month follow-up might not be adequate to assess the late benefit or evaluate events. Finally, the evaluation of an intracoronary image was not performed in this study. In summary, despite high restenosis rate, BMS plays a role in the era of DES. DXM is an old and safe medication with high anti-inflammatory properties. This study suggests that DXM exhibits a lower trend toward TLR and restenosis rate compared to placebo. 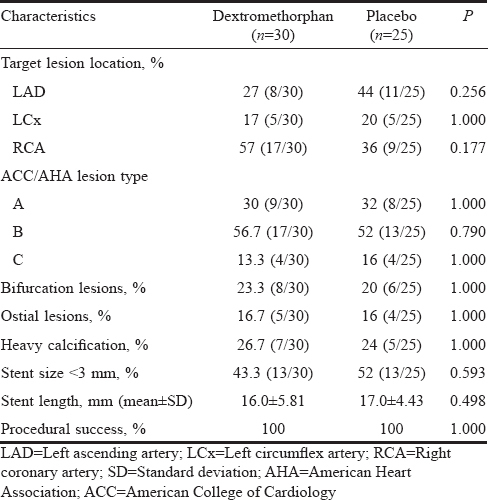 Nonetheless, further extensive studies are warranted to elucidate the anti-restenosis and beneficial clinical effects of DXM on atherosclerotic cardiovascular disease. Gersh BJ. Coronary revascularization in the 1990s: A cardiologist's perspective. Can J Cardiol 1994;10:661-70. Eeckhout E, Serruys PW, Wijns W, Vahanian A, van Sambeek M, De Palma R. Percutaneous Interventional Cardiovascular Medicine: The PCR-EAPCI Textbook. Europa Edition. Minneapolis, MN, USA Europe: PCR Publishing; 2012. Post MJ, Borst C, Kuntz RE. The relative importance of arterial remodeling compared with intimal hyperplasia in lumen renarrowing after balloon angioplasty. A study in the normal rabbit and the hypercholesterolemic yucatan micropig. Circulation 1994;89:2816-21. Gordon PC, Gibson CM, Cohen DJ, Carrozza JP, Kuntz RE, Baim DS, et al. Mechanisms of restenosis and redilation within coronary stents – Quantitative angiographic assessment. J Am Coll Cardiol 1993;21:1166-74. Baim DS, Levine MJ, Leon MB, Levine S, Ellis SG, Schatz RA, et al. Management of restenosis within the Palmaz-Schatz coronary stent (the U.S. Multicenter experience. The U.S. Palmaz-Schatz stent investigators. Am J Cardiol 1993;71:364-6. Stone GW, Moses JW, Ellis SG, Schofer J, Dawkins KD, Morice MC, et al. Safety and efficacy of sirolimus- and paclitaxel-eluting coronary stents. N Engl J Med 2007;356:998-1008. Colombo A, Giannini F, Briguori C. Should we still have bare-metal stents available in our catheterization Laboratory? J Am Coll Cardiol 2017;70:607-19. Tortella FC, Pellicano M, Bowery NG. Dextromethorphan and neuromodulation: Old drug coughs up new activities. Trends Pharmacol Sci 1989;10:501-7. Liu Y, Qin L, Li G, Zhang W, An L, Liu B, et al. Dextromethorphan protects dopaminergic neurons against inflammation-mediated degeneration through inhibition of microglial activation. J Pharmacol Exp Ther 2003;305:212-8. George CP, Goldberg MP, Choi DW, Steinberg GK. Dextromethorphan reduces neocortical ischemic neuronal damage in vivo. Brain Res 1988;440:375-9. Britton P, Lu XC, Laskosky MS, Tortella FC. Dextromethorphan protects against cerebral injury following transient, but not permanent, focal ischemia in rats. Life Sci 1997;60:1729-40. Teirstein PS, Massullo V, Jani S, Popma JJ, Mintz GS, Russo RJ, et al. Catheter-based radiotherapy to inhibit restenosis after coronary stenting. N Engl J Med 1997;336:1697-703. Lefkovits J, Topol EJ. Pharmacological approaches for the prevention of restenosis after percutaneous coronary intervention. Prog Cardiovasc Dis 1997;40:141-58. Brito FS Jr., Rosa WC, Arruda JA, Tedesco H, Pestana JO, Lima VC, et al. Efficacy and safety of oral sirolimus to inhibit in-stent intimal hyperplasia. Catheter Cardiovasc Interv 2005;64:413-8. Hausleiter J, Kastrati A, Mehilli J, Vogeser M, Zohlnhöfer D, Schühlen H, et al. Randomized, double-blind, placebo-controlled trial of oral sirolimus for restenosis prevention in patients with in-stent restenosis: The Oral Sirolimus to Inhibit Recurrent In-Stent Stenosis (OSIRIS) trial. Circulation 2004;110:790-5. Waksman R, Ajani AE, Pichard AD, Torguson R, Pinnow E, Canos D, et al. Oral rapamycin to inhibit restenosis after stenting of de novo coronary lesions: The Oral Rapamune to Inhibit Restenosis (ORBIT) study. J Am Coll Cardiol 2004;44:1386-92. Rodríguez AE, Rodríguez Alemparte M, Vigo CF, Fernández Pereira C, Llauradó C, Vetcher D, et al. Role of oral rapamycin to prevent restenosis in patients with de novo lesions undergoing coronary stenting: Results of the Argentina single centre study (ORAR trial). Heart 2005;91:1433-7. Chaabane C, Otsuka F, Virmani R, Bochaton-Piallat ML. Biological responses in stented arteries. Cardiovasc Res 2013;99:353-63. Li G, Liu Y, Tzeng NS, Cui G, Block ML, Wilson B, et al. Protective effect of dextromethorphan against endotoxic shock in mice. Biochem Pharmacol 2005;69:233-40. Zhang W, Wang T, Qin L, Gao HM, Wilson B, Ali SF, et al. Neuroprotective effect of dextromethorphan in the MPTP Parkinson's disease model: Role of NADPH oxidase. FASEB J 2004;18:589-91. Moses JW, Leon MB, Popma JJ, Fitzgerald PJ, Holmes DR, O'Shaughnessy C, et al. Sirolimus-eluting stents versus standard stents in patients with stenosis in a native coronary artery. N Engl J Med 2003;349:1315-23. Stone GW, Ellis SG, Cannon L, Mann JT, Greenberg JD, Spriggs D, et al. Comparison of a polymer-based paclitaxel-eluting stent with a bare metal stent in patients with complex coronary artery disease: A randomized controlled trial. JAMA 2005;294:1215-23. Aslanabadi N, Separham A, Beheshti R, Ghaffari S, Sohrabi B. OPTIMA Tacrolimus-eluting stent: A twelvemonth clinical follow up with two different periods of dual antiplatelet therapy; 2-month vs. 6-month Approach. J Cardiovasc Thorac Res 2012;4:81-4. Gouveia V, Oliveira DC, Tenorio E, Brito N, Sarinho E. Percutaneous coronary intervention: Safety of methotrexate and its possible benefits on restenosis after bare-metal stent deployment. Cardiol Res 2016;7:104-9. Poder TG, Erraji J, Coulibaly LP, Koffi K. Percutaneous coronary intervention with second-generation drug-eluting stent versus bare-metal stent: Systematic review and cost-benefit analysis. PLoS One 2017;12:e0177476. Baschet L, Bourguignon S, Marque S, Durand-Zaleski I, Teiger E, Wilquin F, et al. Cost-effectiveness of drug-eluting stents versus bare-metal stents in patients undergoing percutaneous coronary intervention. Open Heart 2016;3:e000445.